Cambridge Analytica bought psychological profiles on individual US voters, costing roughly 75 cents to $5 apiece, each crafted using personal information plundered from millions of Facebook accounts, according to revealed internal documents. Over the course of the past two weeks, whistleblower Chris Wylie has made a series of claims against his former employer, Cambridge Analytica, and its parent organizations SCL Elections and SCL Group. He has alleged CA drafted in university academic Dr Aleksander Kogan to help micro-target voters using their personal information harvested from Facebook, and that the Vote Leave campaign in the UK's Brexit referendum “cheated” election spending limits by funneling money to Canadian political ad campaign biz AggregateIQ through a number of smaller groups. Cambridge Analytica has denied using Facebook-sourced information in its work for Donald Trump's US election campaign, and dubbed the allegations against it as "completely unfounded conspiracy theories." A set of internal CA files released Thursday by Britain's House of Commons’ Digital, Culture, Media and Sport Select Committee includes contracts and email exchanges, plus micro-targeting strategies and case studies boasting of the organization's influence in previous international campaigns. Among them is a contract, dated June 4, 2014, revealing a deal struck between SCL Elections and Kogan’s biz Global Science Research, referred to as GS in the documents. It showed that Kogan was commissioned by SCL to build up psychological profiles of people, using data slurped from their Facebook accounts by a quiz app, and match them to voter records obtained by SCL. The app was built by GS, installed by some 270,000 people, and was granted access to their social network accounts and those of their friends, up to 50 million of them. The information was sold to Cambridge Analytica by GS. The idea being that, armed with these Facebook-based psychological profiles and linked electoral records, SCL could narrowly target voters with messaging, ads, and whatnot, to influence their political views, in theory. SCL would have some kind of grasp on each person's personality and level of Republican party support, and apparently exploit this to nudge voters' thoughts in one direction or another. It can be argued that these ads and propaganda may not have any real effect on folks, or not as much as SCL hyped, but in any case, it's claimed this profiling and targeting took place and influencing was attempted. 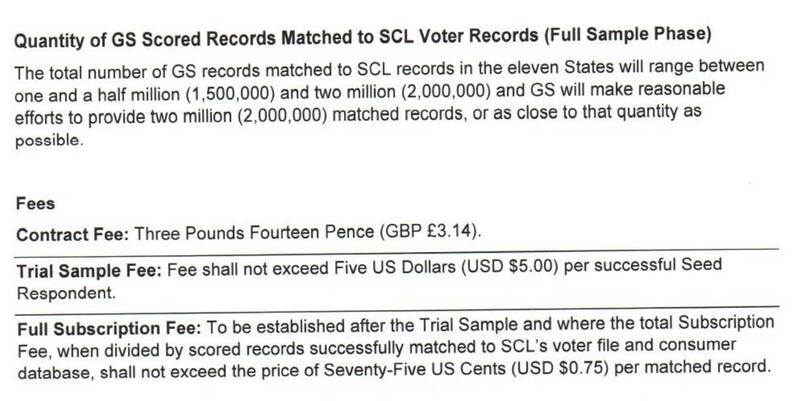 The contract [PDF, from page 67] stated that GS had to provide SCL ideally with two million matched records of American citizens across eleven US states: Arkansas, Colorado, Florida, Iowa, Louisiana, Nevada, New Hampshire, North Carolina, Oregon, South Carolina, and West Virginia. Earlier this week, Wylie told British members of Parliament that the GS work took place in three phases: a very small pilot to see if accounts on social networks could be matched to electoral register entries; a bigger one to make sure GS could acquire data at the speed required; and then the much larger slurp. The contract fleshed out the first two stages, stating that the trial sample would cover 10,000 to 30,000 citizens, and the full sample would cover between 1.5 and 2 million matches; a possible extension is mentioned but no figures were given. GS's fee was a nominal £3.14, and up to $5 per person during the trial stage. The maximum payment would have been $150,000 for 30,000 records. The price tag for the full sample was to be established after the trial, the document stated, but the total fee was not to exceed $0.75 per matched record. The total cost of the full sample stage would have been up to $1.5m for all two million matches. Wylie claimed roughly $1m was spent in the end. The minimum data points required per matched person were: forename, surname, gender and location, along with four GS-modeled components: “big five personality scores” according to OCEAN (openness, conscientiousness, extraversion, agreeableness, and neuroticism); a Republican party support score; a political involvement/enthusiasm score; and a political volatility score. Additional data points are listed: date of birth; ZIP code; residential address, or any component thereof; and answers to political quizzes, if completed. Elsewhere in the cache are documents relating to the relationship between AggregateIQ and SCL. One file laid out an AIQ contract to develop a platform called Ripon – which SCL and later CA is said to have used for micro-targeting political campaigns – in the run-up to the 2014 US mid-term elections. Although this document wasn't signed, it indicated the first payment to AIQ was made on April 7, 2014: a handsome sum of $25,000 (CA$27,000, £18,000). 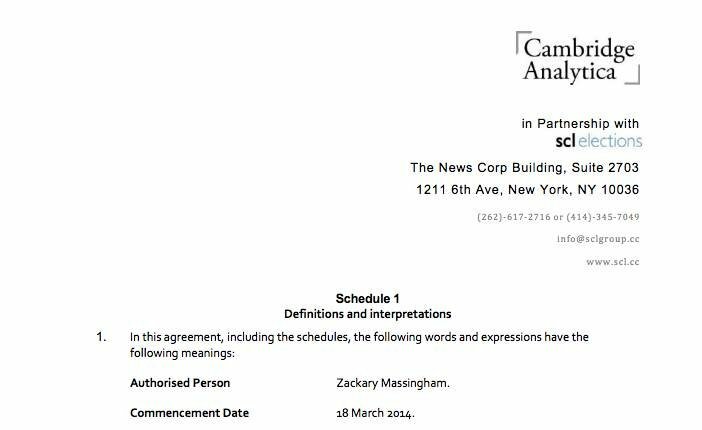 It is worth noting here that AIQ previously stated it had “never entered into a contract with Cambridge Analytica.” While the deal is written as being between SCL and AIQ, it is drawn up on Cambridge Analytica-headed paper. A scalable engagement platform that leverages the strength of SCLs modelling data, providing an actionable toolset and dashboard interface for the target campaigns in the 2014 election cycle. This will consist of a bespoke engagement platform (SCL Engage) to help make SCLs behavioural microtargeting data actionable while making campaigns more accountable to donors and supporters. Deliverables include the ability to send bulk physical and email lists, carry out robo-dialing, and send volumes of text messages to “target individual voters, or groups of voters” – all of which were due to be in beta by August 5, 2014 – and online marketing and social integration, due for beta by September 5. A separate contract showed the two companies had worked together before this. It is dated November 25, 2013, and set out a deal in wbhich AIQ would “assist” SCL by creating a constituent relationship management (CRM) system and help with the “acquisition of online data" for a political campaign in Trinidad and Tobago. A large section in the document, under the main heading for CRM deliverables, between sections labelled “reports” and “markup and CMS integration design / HTML markup,” is heavily redacted. The document dump also revealed discussions between Rebekah Mercer, daughter of billionaire CA backer Robert Mercer, and Trump strategist Steve Bannon, about how to manage the involvement of UK-based Cambridge Analytica – a foreign company – with American elections and US election law, as well as praise for SCL from the UK's Ministry of Defence.